I met a fighter on Sunday at the Sheep and Wool Festival. Her name is Joyce, and she has beaten fourth-stage cancer. She beat the cancer and now she's working on the disabilities cancer left her with. They told her she was going to die, but she didn't. They told her she'd never walk again, and she does. They told her she'd never speak again, but she read books out loud to her dogs for months, and now she speaks well. They said she'd never use her hands because of the numbness and neuropathy, but she's working on that. Part of her self-imposed rehab for her hands is learning to knit and spin. I was honored to get her going on a spindle on Sunday, and in that way, she allowed me to become part of her healing. God bless you, Joyce. Keep healing. Keep spinning. Keep telling your story. All I can say is "wow, what a role model." There truly is greatness in the world!!! Way to go sister Joyce! 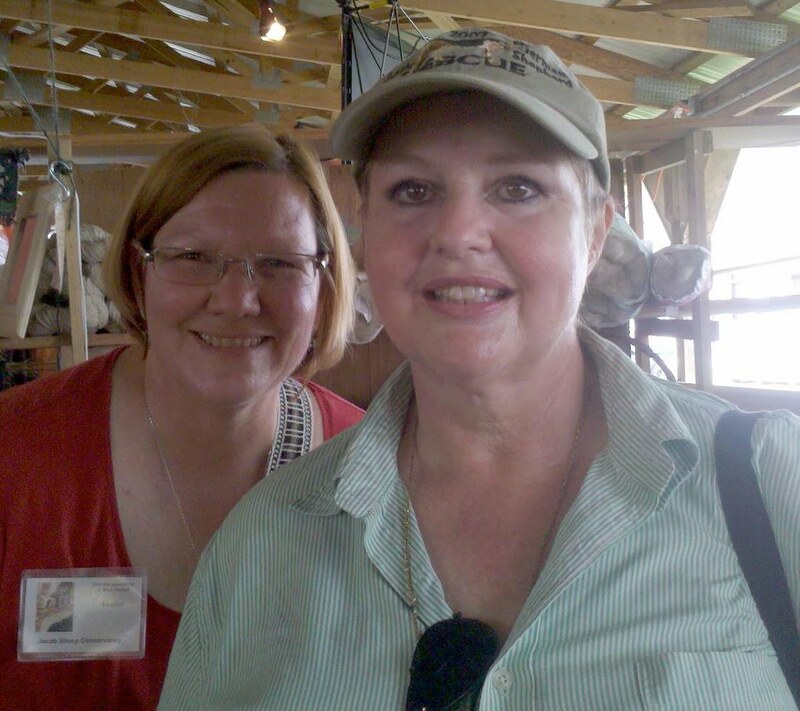 I met Cindy when I just finished my cancer treatments too! God put her in my path of recovery and I am so blessed! Not only Cindy but a whole list of other fabulous ladies as well!!! Spinning and knitting has been my therapy and I know that it will be yours too! God bless! Such inspiration and determination! I hear so many people say things like "Oh I can't knit because of my arthritis..." "I can't go on walks because of my bad back..." Of course you can't if you convince yourself you can't. We have to believe "I can..."
Hats off to Joyce! May she be an inspiration the next time I feel like moaning over something very minor! What a great story, please give her my love, Cindy and keep us posted on how her spinning goes! Oh, and you and the Red Barn Gang were mentioned at church on Monday night, when we had a speaker who came from Australia was talking to us about international leadership! You go, Joyce! Talk about dedication and determination.